ESPN Rings in 2015 with its Most-Viewed Week Ever - ESPN Press Room U.S. Buoyed by the inaugural College Football Playoff Semifinals and its first ever NFL Playoff telecast – three of the top eight most-viewed programs in cable television history, ESPN earned the most-viewed week in its 35-year history, averaging 4,119,000 viewers from Monday, Dec. 29, 2014 – Sunday, Jan. 4, 2015, according to Nielsen. The Allstate Sugar Bowl featuring No. 4 Ohio State’s victory over No. 1 Alabama (Thursday, Jan. 1 at 9 p.m. ET) became the most-viewed program in cable television history, garnering 28,271,000 viewers. The Rose Bowl Game Presented by Northwestern Mutual, which saw No. 2 Oregon defeat No. 3 Florida State (January 1 at 5 p.m.), produced the second most-watched program in cable history with 28,164,000 viewers. ESPN’s unprecedented stretch concluded with the NFL Wild Card game which resulted in the Carolina Panthers defeating the Arizona Cardinals (Saturday, Jan. 3, at 4:20 p.m.), earning 21,678,000 viewers, the eighth most-viewed program in cable history and ESPN’s second most-watched NFL telecast. ESPN celebrated the New Year in historic fashion on Thursday, Jan. 1, 2015. Starting with SportsCenter and continuing with College GameDay, The 2015 Goodyear Cotton Bowl Classic, The Rose Bowl Presented by Northwestern Mutual, and concluding with the Allstate Sugar Bowl, ESPN averaged 11,680,000 million viewers, making it the most-viewed day ever in the network’s 35-year history. ESPN was the most-watched cable network in primetime in 2014, averaging 2,300,000 viewers. Additionally, ESPN’s 2014 primetime audience saw an increase of +5% in viewership when compared to 2013 (2,194,000 viewers). This marks the first time ESPN has finished No. 1 in primetime within a calendar year. The Outback Bowl, featuring No. 18 Wisconsin defeating No. 19 Auburn in overtime, on January 1, 2015 at noon, averaged 6,400,000 viewers, the most-ever for a telecast on ESPN2. The back-and-forth game also generated a 3.8 rating, a new high for the network as well. Additionally, the New Year’s Day bowl is currently the seventh most-viewed bowl game of 2014-15 season. 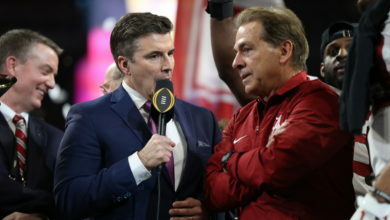 ESPN now claims the top 19 most-viewed programs in cable history with the inaugural College Football National Championship Presented by AT&T to be played Monday, Jan. 12, at 8:30 p.m. (No. 2 Oregon vs. No. 4 Ohio State). Please Note: USA-Portugal from the 2014 World Cup achieved an average audience of 18,200,000 for the game window. However, following the official Nielsen records, this game would not qualify for top 20 cable telecasts of all time because the official Nielsen window for the telecast includes the pre-game show. Overall, ESPN’s 33 bowl telecasts this season have averaged 5,423,000 viewers, up 4% (5,229,000 viewers) from the 2013-2014 bowl telecasts (minus the BCS Championship game).